welcomes boaters from around the world and celebrates the history of boating during their biennial signature event, the Rideau Ferry Vintage Boat Regatta. Navigate through the picturesque hamlets of Port Elmsley, Balderson, Innisville, Ferguson’s Falls, Drummond Centre, Wayside and legendary Rideau Ferry to get the most out of your visit. Drummond North Elmsley is home to champion Ian Millar, internationally renowned equestrian and Olympic Gold Medalist. 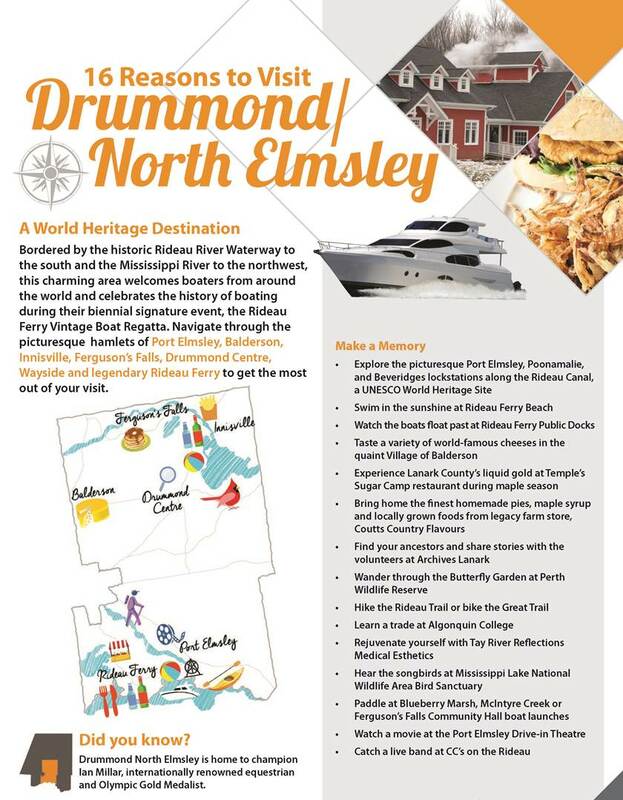 History: The Township of Drummond/North Elmsley was created in 1998 by the merging of the Townships of Drummond and North Elmsley. It is located in central Lanark County and has a population of 7,773.